There are four proposed bike racks each painted a different color that celebrate life on the 4600 block of 14th Street NW. "Car Barn Tower" celebrates the picturesque Trolley Car Barn now used for Metro Busses on the east side of the block. "Theater and Retail Facades" celebrates the theaters central Place on this block of diverse retail. While designed by Charles Bergen the bike racks will be made by Dero a highly experienced bike rack maker. Using Dero for fabrication ensures that the racks will be durable, safe and meet local code requirements. The bench will be 72" wide x 44" tall painted wood. 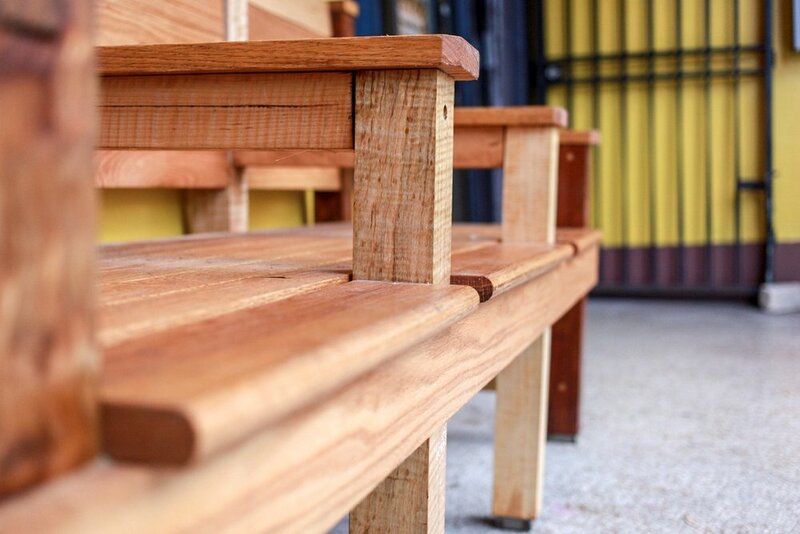 Made out out highly durable Red Oak wood this piece of artful street furniture should last at least 30 years. 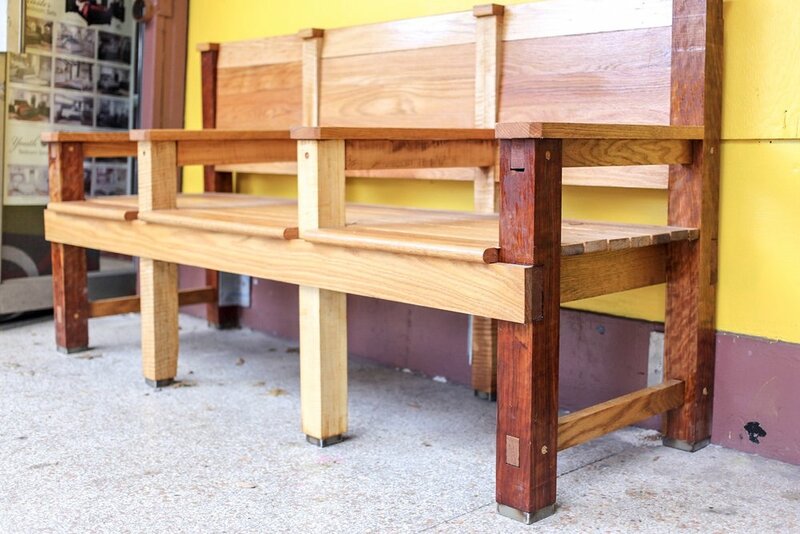 With two armrests in the middle the bench is designed to be inviting to sit but not to sleep on. On the back of the bench visible from the sidewalk will be carved relief ornament based on the Art Deco ornament of the Park Theater. This ornament is geometric, circular and often fan shaped. The relief will be colored to relate it to the bulletin board frame and local storefronts. The bulletin board frame, made of Eastern White Cedar, wood-will fill the space between the 46" w x 84" h cast stone window frame on the building facade and the 36" w x 48" h bulletin board case. The small round ornament at the frame corners plays off of the round stone accents on the curved top of the window frame. The center of the bulletin board will be mounted at 54" above the sidewalk in order to meet ADA. Below the bulletin board cabinet is a large horizontally oriented rectangular space. In this framed area is a large horizontally oriented rectangular panel. In this panel is an infinity pattern crafted out of wood. Like the ornament on the bench this geometric shape was inspired by the ornamental details of the building many of which are circular/round. The two separate circles to symbolize two people dancing. They are interlocked to relate two people dancing together. 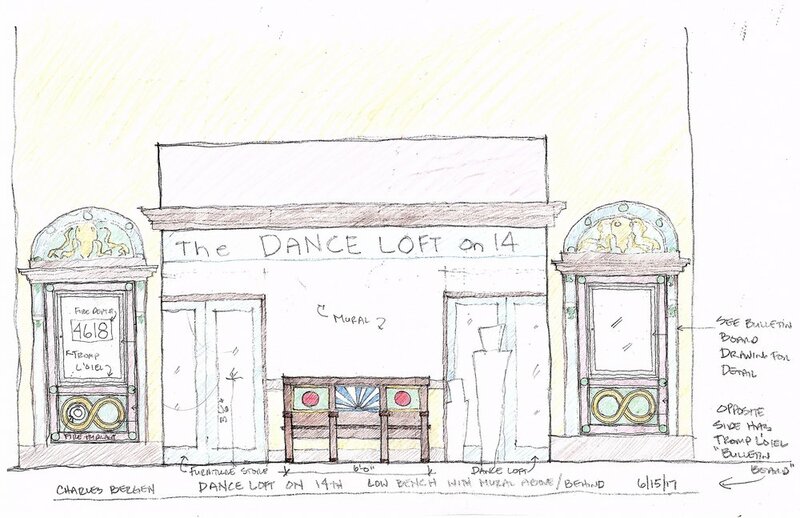 The continuous form was more symbolic of the interactive dance and the community that surrounds Dance Loft on 14. The bulletin board is on the right side of the building facade in a stone frame. There is an identical frame on the left side of the facade. In this frame which is where the fire department connection is located the bulletin board frame is painted on in tromp l'oiel. This faux but realistic frame will be painted by Washington DC born and raised artist Diana Cook. Eastern White Cedar and the Bike Racks will be Dero.